nanonic GmbH is a professional and reliable partner for modern and user-friendly nanolithography solutions. We offer customized state-of-the art facilities and services in the range of R&D oriented electron beam- and FIB-lithography. Rely on forward-looking technologies in combination with intuitive software ergonomics and profit from the advantage of our staff's immediate competence. This marvelous honeycomb pattern was created by employing our eLitho EK 03 with a field emission electron microscope. 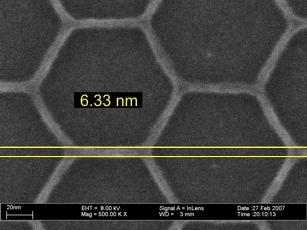 The width of the PMMA lines is clearly below 10 nm.